Don't you love all of those cute charm packs? They give us a chance to own a piece of every fabric in a collection and are a ready made quilt kit! Do you have charm to spare? What I mean by that is, by now, if you're like me, you also have some charm scraps that are leftover from lots of charm projects. Finger Paint is the perfect project to use up some of those leftover charm squares and/or scraps from any project. The block, called the Hard Times block, is easily made using connector corners. The quilts many colors and the center of the block being light reminded me of being in school and of dipping my fingers in paint and moving them in and out, leaving the color on the outside but the paper untouched in the center. I know, perhaps it's a stretch, but that is how the pattern got its name and I love the name! 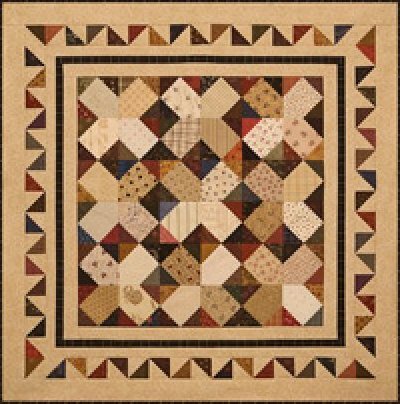 The quilt measures approximately 38" x 38".